Google has just announced it's pulling the plug on its Nexus One Android Web store. 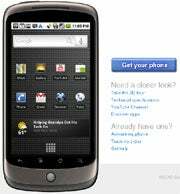 The Nexus One Web store, launched in conjunction with the Nexus One device in January, was designed to give users a one-stop virtual shop to pick up the latest and greatest Android phones. It was meant to mark the start of a new kind of distribution model -- one where you base your decisions on devices rather than on carriers. That model will soon be no more. In a blog posted Friday morning, Google Engineering VP Andy Rubin said the Nexus One Web store simply hasn't worked as well as the company had hoped. "We launched Nexus One in January with two goals in mind: to introduce a beacon of innovation among Android handsets, and to make it quick and easy for people to buy an Android phone," Rubin says. "But, as with every innovation, some parts worked better than others. While the global adoption of the Android platform has exceeded our expectations, the Web store has not." Rubin says Google's Nexus One Web store has "remained a niche channel for early adopters," noting that -- as critics pointed out shortly after the store's launch -- the majority of people prefer sampling a phone in-person prior to making a purchase. "They also want a wide range of service plans to chose from," Rubin says. The fact that both Sprint and Verizon recently backed down on their plans to offer network-specific editions of the Nexus One, opting instead to focus on their own unique flagship Android devices, left only T-Mobile as an officially supported partner for the device. Sure, you could also get an unlocked version of the phone to use on AT&T's network, but -- well, you know. So what'll become of the Nexus One and its soon-to-be-abandoned Web store? The phone itself isn't going anywhere; Google will just begin making it available in retail outlets instead of online. Once the device is on the shelves of various brick-and-mortar stores, the Nexus One Web store will officially shut down. The URL -- google.com/phone -- will instead become a showcase of "a variety of Android phones available globally," with no direct purchasing options in place.